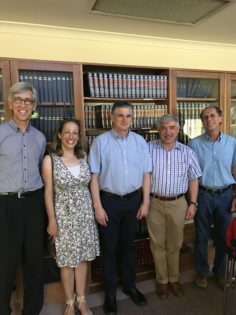 The Australian Friends of the Hebrew University, WA Division, were privileged to host a world-class expert in the field of veterinary medicine. On 19 February, Prof Baneth gave a riveting talk about the cutting-edge facilities and research conducted at the Koret School of Veterinary Medicine at the Hebrew University of Jerusalem. Located within the school is a veterinary hospital which caters to the following disciplines; internal medicine, neurology, animal behaviour, genetics, big animal surgery, equine department and infectious diseases. Additionally the hospital boasts an MRI for animals – especially important for animal neurology – and one of the few Hemodialysis units for animals in the world. The Koret School of Veterinary Science runs the largest emergency animal hospital in Israel, providing 24/7 care for all animals who present with their owners or are found in need of care.